"Attire is Formal" Means... What? THE ROLE OF THIS BLOG, among other things, is to alert you, dear reader, and the rest of the world to important currents in the cultural and political life of the nation and, indeed, the world. So I’m exceedingly proud that "So It Goes" may be the first media outlet (if it can be dignified with such a moniker) to report on at least one extraordinary shift in the Zeitgeist even as that shift happens! Now normally this would be an exciting development, unless of course you find yourself in the middle of the shift and slightly embarrassed by that fact, as I did last week. Let me explain. About two weeks ago, I received an invitation to a pretty high-level dinner event at a five-star hotel in New York City. It included top American and international business executives, leaders from the United Nations, prominent journalists and, well, people like me, but never mind that. I mention this not to brag but to set the context. On the invitation were the words “attire is formal.” I instantly interpreted that to mean that I should wear a tuxedo. When I arrived at the fancy event at the fancy hotel with fancy food and fancy people, I was one of maybe, oh, four men wearing a tuxedo out of, oh, 250. Awkward? You bet. But, as everyone will tell you, it’s always better to be overdressed than underdressed, though I was waiting all night for someone to hand me their dirty plate or used wine glass, mistaking me for one of the servers (thought not all of the servers were wearing tuxedos either). But how, I asked myself, did everyone other than us four schleppers get the memo not to wear a tux? Surely not everyone phoned to find out what the modern-day definition of “formal” is (though you can bet I will from now on before I head off to the formalwear shop to rent another tux). It’s an intriguing sociological riddle that weighed on me ever since. And I’ve decided to test it on others, if only to ease my embarrassment. Since I went to the dinner, I’ve asked probably about 80 people (a large number of them via an e-mail group of people who identify themselves as “fashionistas,” meaning people in my firm involved in fashion p.r.). About 90 percent of the men I asked, including some with equisit sartorial sensibilities that far exceed my own (which doesn’t take much – remember, I don’t even own a tux), responded without hesitation that they, too, would wear a tux if they heard the words “attire is formal.” About half the fashionistas (most are women) agreed, but a large number (about 40-plus percent) were adamant that it means a dark business suit. The balance said that I should have called first to clarify. I feel a tad vindicated, but mostly this tells me one thing: that there is no consensus anymore about what “formal” stands for. The moorings of our collective cultural consciousness are coming undone. Have we finally, thank goodness, come to our senses and realized how impractical and pretentious it is to wear a tuxedo? 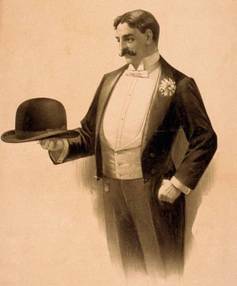 When you think of it, wearing a tux is a silly throwback (as I have just learned) to a convention invented by Pierre Lorillard IV, the son of a 19th century tobacco magnate, who lived in Tuxedo Park, New York, and whose life revolved around the highest of high society. This garb, in fact, was meant to be a rebellion against the cultural standards of Europe. What was once rebellion is now seen as the emblem of The Establishment, whatever that is anymore. Which reminds me that I once was invited to a big fundraising event a number of years ago by a national Latino organization, and the invitation said “Black Tie.” Odd, I thought, that an organization dedicated to promoting the identity of the Latino community would want to pay homage to the most blue blood of culture conventions. It's worth noting that I showed up in a tux that night, and fewer than half of the other men did, too. So the next time I was invited to a “Black Tie” event, I figured I wouldn’t bother, and I was one of maybe three guys who didn’t wear a tux. The whole thing has gotten so ambiguous, the meaning and purpose of wearing a tuxedo so lost to history in the first place, that I think it’s time we just retire the tuxedo from our culture altogether. That would be a real shift in our Zeitgeist. But then the formalwear shops would go nuts, wouldn’t they?